What about you? I’d love to hear your sewing goals, and maybe we can even motivate each other throughout the year to actually achieve most of them! Happy 2011, and happy sewing! By the time I get to the hemming stage of a project, I am more than ready to wear my new garment! Plus, I like figuring out ways that I can speed up the prep jobs and other “non-sewing” tasks that are necessary parts of the sewing process. My brain just seems to get a kick out of figuring out how to do things faster, easier, better. 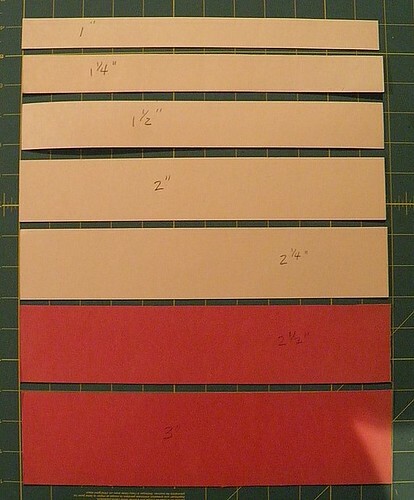 The fastest way I know to mark hem allowances is to make a collection of cardboard templates. I just use old manila file folders, cut them into strips of varying widths with a rotary cutter, and snap! A new sewing tool. Cheap, easy, and fast – what could be better? I made a set of these handy little hem templates in graduated widths – 1″, 1.25″, 1.5″, etc – all the way up to 3″. Pretty sweet, huh? Now whenever I need to press up a hem, I turn on my iron, grab the appropriate template width, and the job is done in a jif. Give yourself a Christmas present, and make a set of these easy templates to speed along your hemming task. I seem to have a perpetually messy sewing room. No matter my intentions, my space seems to degenerate into a ummmm, porcine place of repose with some frequency. Today I decided to tackle my sewing desk area – since it was in a state that would not actually allow for sewing. Crisis time! I sorted threads by color and type, and put them into their respective storage units. All of my sewing machine needles went into a cute little box, extra feet ino another, and tools went into a third. 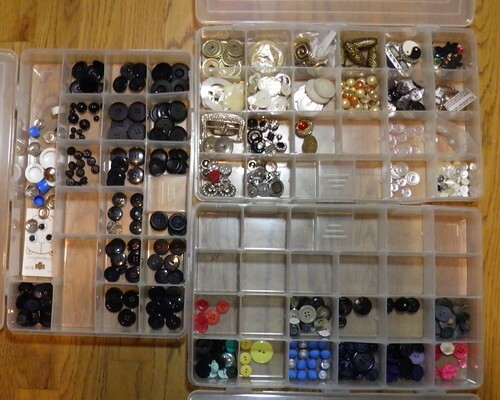 After a little more sorting, storing and straightening, I opened my button drawer. You have one too – full of spares, mistakes, leftovers, miscellaneous purchases, and even some treasures. But the trick is actually finding and using any of the contents on a real garment! Some time back I had purchased a bait box on the recommendation of a fellow sewing nerd, and I spied it hiding in a dusty corner of my sewing room. Perfect! Presto-changeo, I added the little worm-y dividers (yuck! 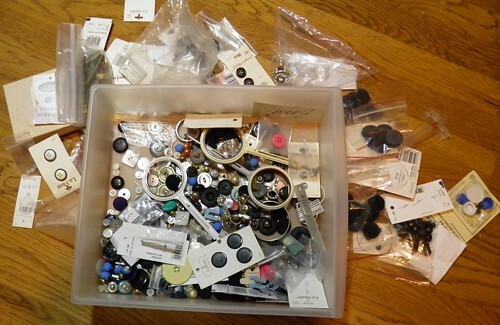 ), and started sorting buttons. I felt like a little kid again going thru my mom’s buttons. It was really fun to think about the garments I had made and the places I had bought all these buttons. OK, the whole process did take quite a while and a few glasses of wine to complete, but wow-zers! I might actually be able to find/use some of my buttons now! And these pixs are just a bonus. 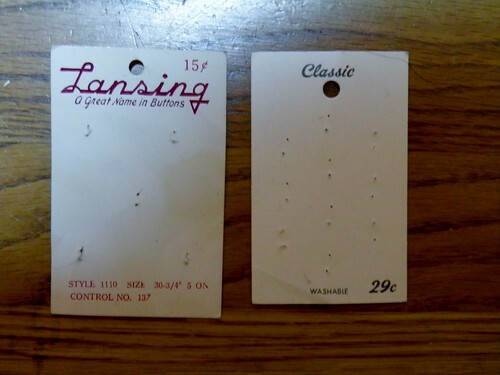 Take a look at these vintage button cards. Seriously peeps! Tweny-nine cents for a card of buttons? Thirty-nine cents? 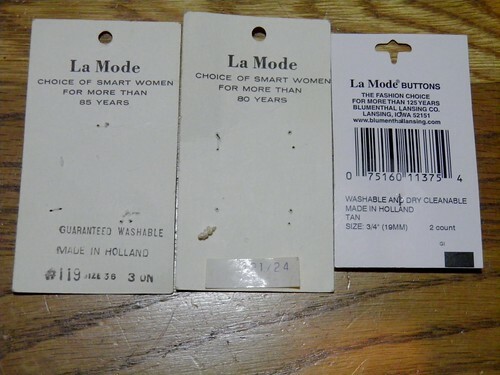 La Mode buttons are still made in Hollland, at least as of the semi-recent card I added for perspective. I haven’t seen Lansing or Classic in the stores in ages, but I thought you’d get a kick out of these cards. I did! There are many steps to creating a garment. Designing and planning, preparing your fabric choice, cutting and marking all the pattern pieces on your fabric, interfacing and possibly underlining, and there is even some sewing involved! Some sewists love every step along the creative path to a completed garment, and others….not so much. Pressing. Turn on your iron to the appropriate setting for your fabric, pop in a good movie that does not actually require your concentration, and get ready to tame those wrinkles. If you remembered to look at the care code on the bolt when you bought your fabric, follow those instructions. If not, in general I use steam for wool, cotton, linen, and sometimes for polyester. I do not use steam for silk as it can waterstain and leave marks. It is a good idea to use a scrap (about 18 inches square) of silk organza as a press cloth to protect the surface of your fabric. Press the full length and width of your fabric thoroughly as a single layer; do not press a crease along the fold as this can sometimes show in the final garment. This important step ensures that your fabric is smooth and will help you cut the pattern pieces true to size. Tissue pattern prep. Before you turn off your iron (do turn off the steam! ), also iron your tissue pattern to remove wrinkles. If you are using a pattern that is marked on heavier paper and you did not trace it off onto lighter tissue, you can also iron that paper. This is a quick step that should only take a few minutes, and again helps ensures that you will cut the pattern pieces the correct size. Layout. Start by looking at your pattern instructions. There will be several recommended pattern layouts based on pattern size and fabric width. I don’t always follow the suggestion, but I usually look at it. Well, sometimes I do anyway. But do as I say, not as I do! If your fabric has a nap (like velvet or corduroy) you need to lay all the pattern pieces in the same direction. If you are using a plaid fabric, be sure to match the plaid particularly on all “major” seam lines. 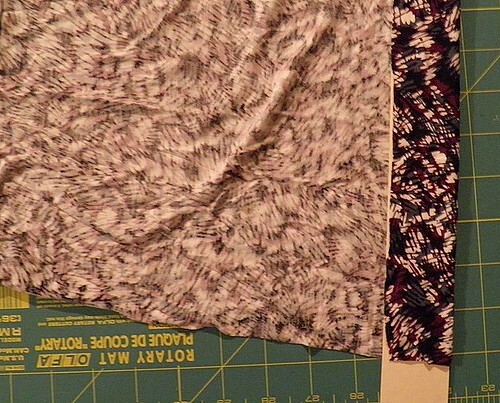 Be sure to place pattern pieces that belong “on the fold” along the fold line of your fabric. Carefully align all the pattern pieces to the vertical grain of the fabric, or as indicated on the pattern piece (ex: bias grain layout). Also be sure to cut out the pattern pieces as many times as the pattern requires; this might be once, twice, or more! The pattern layout step is time-consuming, but it is critical to producing the garment as the designer intended, and also one that will drape and look correct on the body. Check your layout carefully a second time before actually cutting, and do not try to do this step when you are tired. Or have had a couple glasses of wine. Just saying….I have heard there are some people who combine these two activities, but I do not condone it. Cutting. This is where the rubber meets the road, and there is no turning back. The most important part of cutting is accuracy. Cut right along the cutting line of your pattern. Some designer and pattern maker spent a lot of time ensuring that all the pieces of the pattern will actually fit together – so don’t mess up the plan up by cutting the pieces bigger or smaller than intended. Too big or too small will not do, only “just right”. It is personal choice whether you use a rotary cutter or shears, but regardless cut, accurately. Did I mention you need to cut accurately??? Now is a good time for a glass of wine. 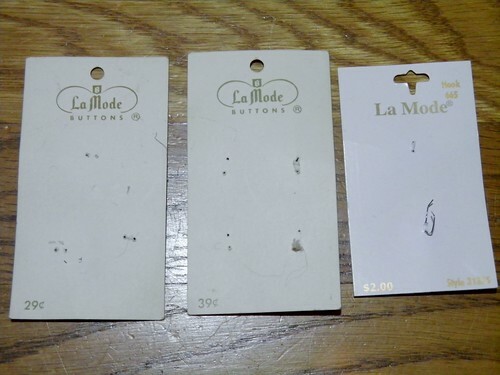 You have finished a big step in your garment construction. Before you move those pattern pieces around too much, they need to be marked. But that is a lesson for another day.